Little Sister Yanni and Big Sister Karen Lubov strike a pose at this year’s Volunteer Appreciation Breakfast. View more photos from the event. Big and Little Sisters who had been matched for as little as one month to as long as 11 years gathered at the Royal Sonesta Hotel in Cambridge to celebrate their relationship at Big Sister’s Annual Volunteer Appreciation Breakfast April 16th 2011. The fun-filled breakfast featured an inspirational speech by one of Boston Business Journal’s 40 under 40, Alicia Canady, and the percussive stylings of The Genki Spark, a Japanese Taiko drumming troupe. Big Sister Chief Operating Officer Mia Roberts and Board Members Tim O’Brien and Max Bardeen presented Certificates of Appreciation to the 26 matches that have been together for longer than five years. A special congratulations goes out to Big Sister Julie Atwood Drake and Little Sister Naquana as well as Big Sister Ellen DePaul Fisher and Little Sister Thelma who have been together for over a decade. Ms. Canady, the founder and Executive Director of the Young Black Women’s Society, spoke of her youthful struggles and the support, mentorship and empowerment she received from her shero, Jaye Smith. The Japanese Taiko drumming troupe, The Genki Spark: Payal Sharma, Jennifer Moy, Christine Engle, Mayuko Yamamoto & Karen Young. Next, America’s first and only all-Asian Taiko drumming troupe, The Genki Spark, brought their explosive sound and zestful spirit to the stage. Big and Little Sisters also got their chance to wield the taiko drumsticks on stage and off after the event. Big Sister’s Helen Fullerton looks on as Little Sister Jonalys extols the virtues of her Big Sister Chelsea Jones. View more photos from the event. The event closed with an open-mic session opened by former Little Sister Starleana Searcy where Little Sisters had a chance to speak about their Big Sisters and what they meant to them. There were many words of love and appreciation for the support and guidance they received from their mentors. “What hit me then was the importance of role models. Every girl, whether she wants to be a journalist, a professional athlete or a full-time world traveler should have a woman role model they can emulate, see a bit of themselves in, and be inspired by. All girls should get an experience like I did at least once in their lives, to be able to sit down at a table with their own version of Jenni Hogan. To your Little Sister, you are her role model. Thank you Big Sisters, for being that influential woman in a young girl’s life. 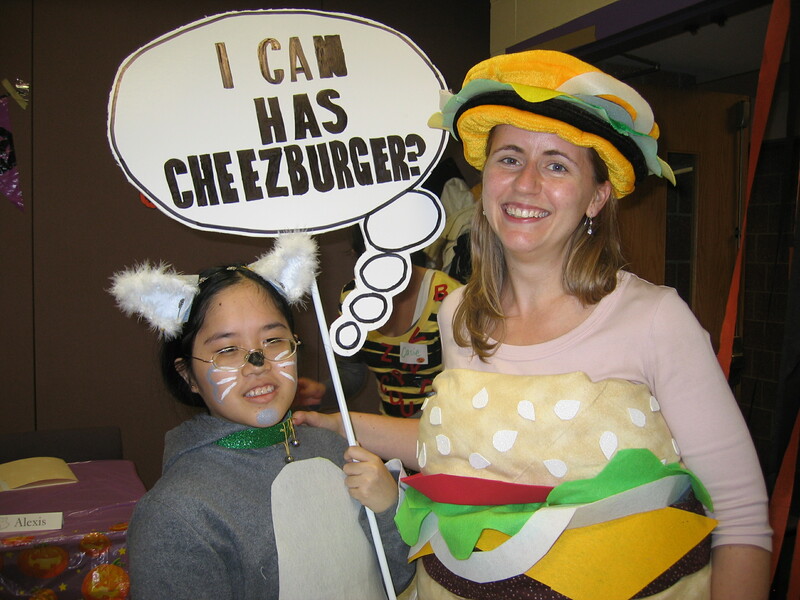 Little Sister Roseanne & Big Sister Joy Falk showing off their creativity at the 2010 Halloween Party. In celebration of National Volunteer Week, we would like to thank our Big Sisters who collectively volunteered over 170,000 hours to mentor 2567 girls last year! See more pictures of our Big Sisters and Little Sisters on Facebook. To learn more about becoming a Big Sister contact us at bigsister@bigsister.org , call us at 617-236-8060 or visit our website. 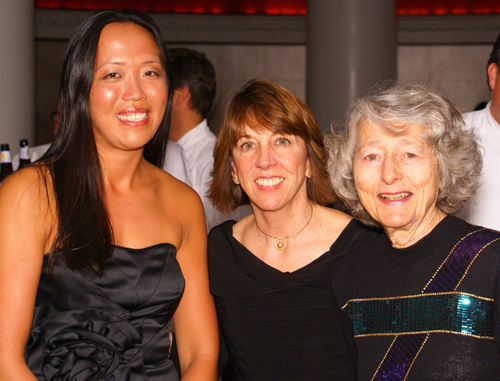 Former Little Sister Jesse Kwan, Big Sister CEO Deborah Re, and Former Big Sister Executive Director Jeanne Yozell at the 12th Annual Celebrity Chef at Radius. Photo: Jacob Thomas Drouin. View more photos of the event on Facebook. At the 12th annual Celebrity Chef event that occurred last night at Radius, former Little Sister Jesse Kwan shared her story of emigrating to the US from Hong Kong as a little girl and the life-changing impact her relationship with her Big Sister Jackie Church had on her life. Here are her words. Good evening. Not in a million years would I imagine that I would be standing in front of you today to talk about my journey as a Little Sister in a language that was once foreign to me, a language that my mother often referred to as chicken intestines, because that’s what written English looked like to her. Yesterday was the 22nd anniversary of my immigrating to Boston with my mother. We came in the spring of 1989 to reunite with my father who was already here. In just shy of a year of our arrival when I was 10, my father passed away. My mother and I were devastated. We were left with virtually no family, speaking no English, and knowing little about American Culture. 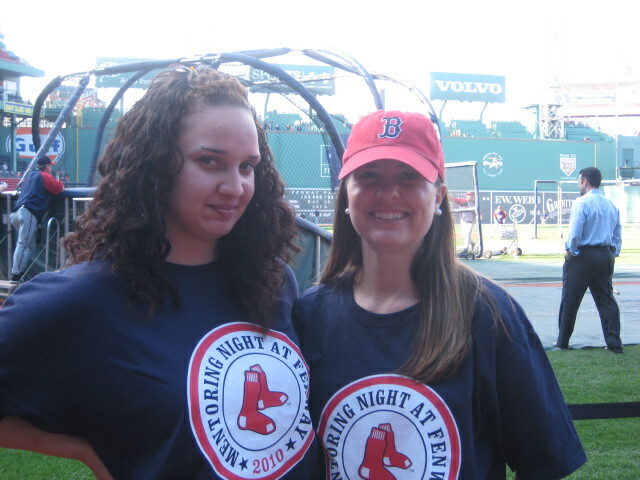 We were very fortunate to have been surrounded by good people and a counselor suggested that I get a mentor through Big Sister Association of Greater Boston. Little did I know then the enormous affect this organization would have on me for the rest of my life. I still remember that hot summer day extending my neck to the window, peaking out to wait for Helen, my then social worker and Jackie, my new Big Sister, to show up. I remember practicing over and over again in my head how I had to enunciate my imperfect English in hopes that she wouldn’t laugh at me. I don’t think I uttered more than a mere hello that day. This woman who had the biggest smile had no idea the amount of headache and heartache I was about to put her through in the next 20 years, the amount of gray hair I was about to give her, the amount of love that she was going to teach me. 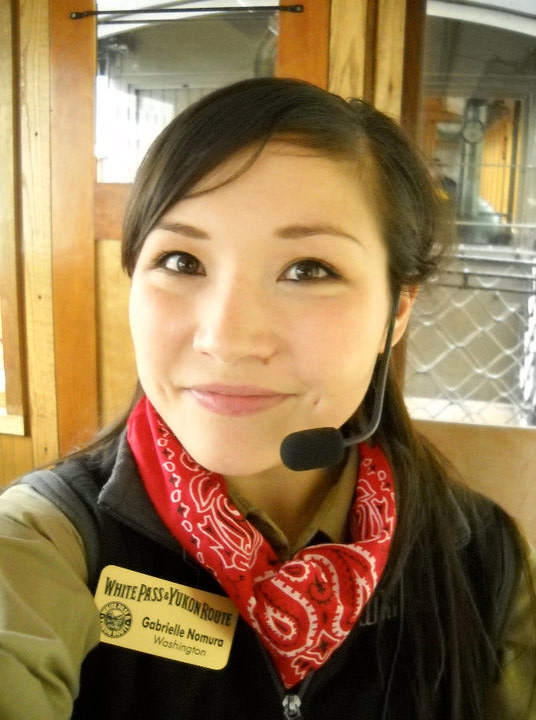 At first, I wasn’t quite sure what I was going to do with Jackie or what I was going to say to her because there was oh, a slight language barrier. I started out in bilingual education in school here then, but there were still challenges in communication AND I was extremely shy. But thank goodness for dictionaries and the international language of using our hands. In every sense of the word, Jackie broadened my horizons. She brought me to my first Halloween party, me dressing up as a robot, her as a pirate. She brought me to my first sleepover at the Museum of Science. Now that was cool for an 11 year old girl! She persuaded my mom to let her only daughter study abroad in France for 3 months while in high school. When I was 20, Jackie surprised me with a trip to Paris to celebrate the Millennium. Navigating through the educational system with a mom who did not speak English was not easy. 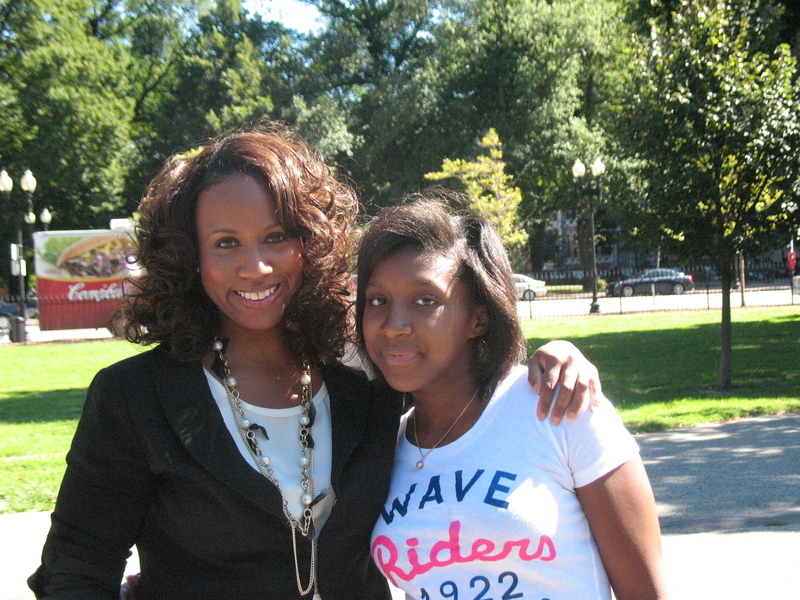 Jackie was phenomenal in helping my mom and I review our options of taking entrance exams to the top Boston Public Schools and applying for scholarships to private schools. She helped me with practice tests, especially vocabulary and comprehension, my constant struggle. When I got my acceptance into Boston Latin I remember picking up that phone and calling Jackie at work. “I got in! I got in!” I screamed. “As if I didn’t know that already” was her response. Jackie encouraged me to try so many different things. She challenged me to challenge myself, to be my own person, to grow out of my shell. When I found one of my true passions in high school, volleyball, she challenged me to look at colleges with volleyball programs that I could compete in. I ended up being recruited to play NCAA Division 3 Volleyball. To the woman who taught me the importance of wearing socks and gloves in the Boston winter time, who taught me how to slurp my first oyster in Paris, who showed me to stand up for myself, who taught me to take smart risks, who taught me everything good that is in me, that if I work hard enough in life, that I might just accomplish my feats and defeat my innermost insecurities. If it weren’t for her, I would never summon enough courage to talk to you today. I want you to know what a special place Big Sister holds in my heart, the good that it does for young girls for now and generations. Your donation is not just a small gesture but a profound one that impacts and shapes little girls’ lives, as it had mine, that it gives us the mentoring a little girl needs, so that we can acquire the skills to take on the world on our own, one bite at a time. 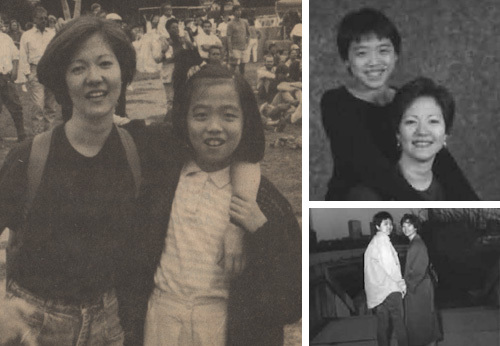 Little Sister Jesse Kwan and Big Sister Jackie Church in the 80's and 90's. Little Sister Jesse Kwan and Big Sister Jackie Church today. Inspire a Girl. Transform our Community. Become a Big Sister. Monday, April 11th from 11:30 a.m. -1:30 p.m.
Wednesday, April 13th from 12 p.m. -3 p.m.
Thursday, April 14th from 12 p.m. -1 p.m.
Thursday, April 14th from 5:30 p.m. -7:30 p.m. This past week I had the privilege of trading in my work flats for stilettos to walk the runway as a guest model for our first annual fashion show to benefit Greater Boston’s girls. 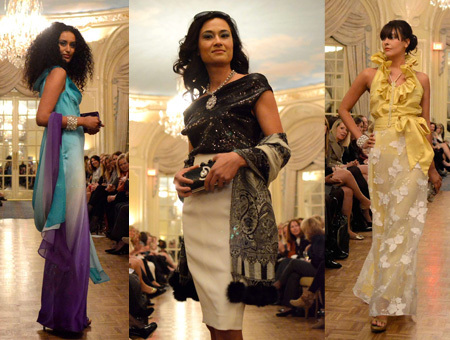 The event was a smashing success, raising nearly $9,000 for Big Sister as Boston-based designer Denise Hajjar showcased her Spring and Summer line at the Fairmont Copley Plaza Hotel. The elegant Oval Room was filled with hundreds of new and familiar faces. 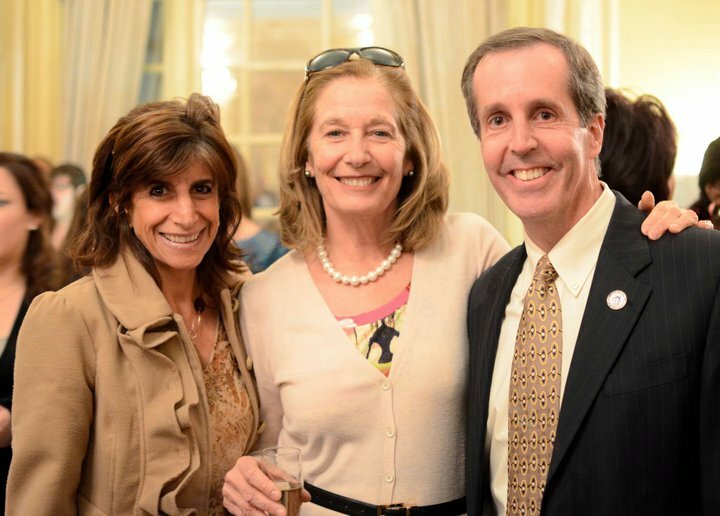 Among the crowd notable names such as State Representative Smitty Pignatelli, Allyce Najimy from the Foundation to be Named Later, Linda Holliday, and author Elisha Daniels were there to support of Boston’s girls. There was so much love in the room for our organization, our Matches, and our work. Backstage was a hectic scene that Project Runway reruns did not prepare me for: long racks of beautiful dresses, tables full of accessories of every kind, shoes by local designer Kristina Kozak, as well as makeup and hair stations. I was joined by other guest models from the Big Sister Community: Board member Jane Deery and Big Sister Bernice Osborne. We had fun chatting with the professional models about fashion show tips, practicing our runway walks, and telling them about Big Sister. They were all interested in our work and I saw a few of them talking to our Recruitment Team after the show. It was great to see the array of different age, race, and size of the models. 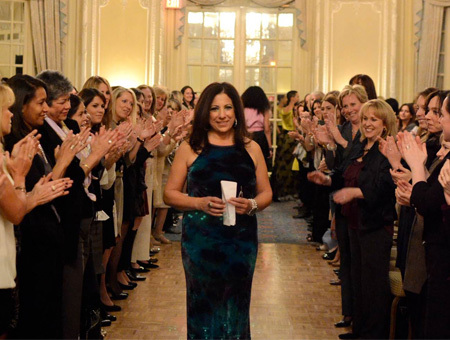 It was clear that Denise Hajjar values diversity and her designs can be worn by anyone. The night was a great accomplishment for the entire Big Sister community. Thank you to everyone who attended this fun event, cheered for the nervous guest models, and offered your kind words after the show. Because of all of you we raised nearly $9,000, made some new friends, and will now be holding this event annually. That means I have approximately 52 weeks to practice “smiling with my eyes” and my fierce walk for next year’s show! Monday, March 4th from 5-8:30 p.m.
Thursday, April 7th from 11:30-1:30 p.m.
Thursday, April 7th from 2-5 p.m.
Thursday, April 7th from 7-8:30 p.m.
Saturday, April 9th from 9:30-12:30 p.m.